Swindon Town FC played in Southern league 1894-1920, Western league 1897-1902 and became a member of the Football league in 1920. The club reached the top division for the first time in 1992 and have a fifth place as their best result. Among other merits is the 1969 victory in the Football League Cup. 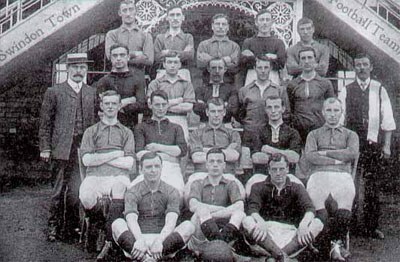 Swindon Town Football Club squad photo from 1902. The existence of the football club began in 1879 as a merge between Spartans and St Mark’s Young Men’s Friendly Society.